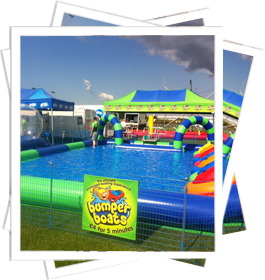 Bumper Boats are the brand new childrens attraction thats been creating waves since their introduction in 2011. 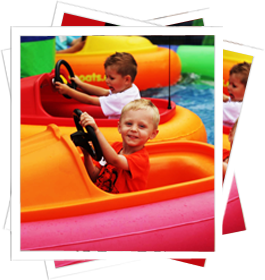 The Bumper Boats are powered by a 12 volt battery pack so only require the child to steer as there are no pedals. Once the child has mastered steering the boat they can also activate the built in water cannon by the push of a button for added fun. Started electronically by one of our trained operators and ending automatically the boat can be directed to a platform for the child to disembark safely. 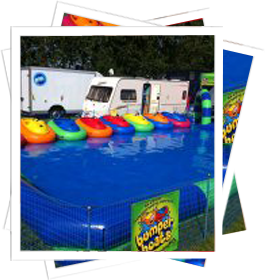 The boats are suitable for children from the age of 3 upwards as they have a low centre of gravity and superb stability in the water. For added safety we also have booster seats with harnesses and two attendants wading in the pool at all times. Ponchos are also available for use in adverse weather conditions or simply to keep the child dry.